On 16th June 1497 Micheal Joseph, a charismatic blacksmith known simply as An Gof, gathered a Cornish army on Blackheath in south east London. After the long march from the south west they arrived in south east London. They had seen their numbers swell from around three thousand, as they crossed the Tamar, to perhaps over ten thousand. Their numbers showing the general resentment to the Crown at the time. 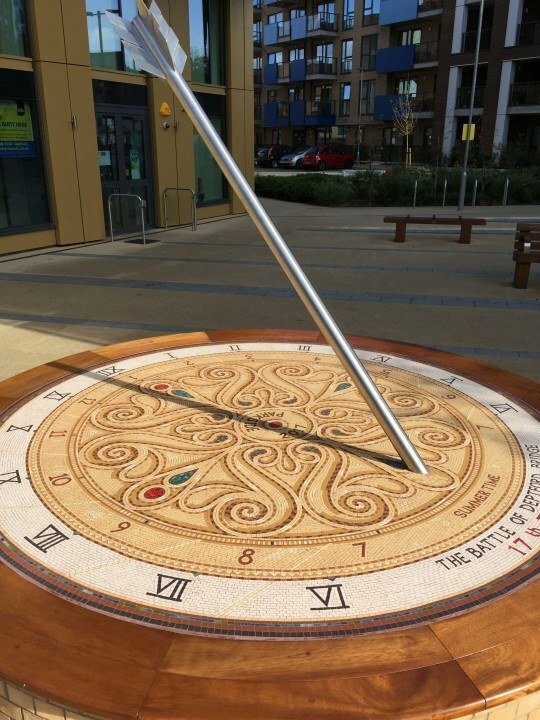 In 2016 Gary Drostle created a sundial memorial mosaic to the Battle of Deptford Bridge in south east London. The background to The Battle of Deptford Bridge sundial memorial mosaic: An Gof was supported by Thomas Flamank, a Lawyer at the Kings Court and the minor aristocrat Baron Audley. The Cornish and their supporters gathered on Blackheath. 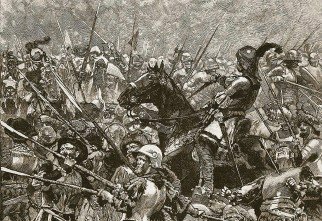 They hoped that the men of Kent would join their cause, following the Kentish uprising forty-seven years earlier led by Jack Cade. The Cornish forces were encouraged by a victory over an English force sent to stop them at Guildford. However such was the ferocity of the Kings clamp down after the Jack Cade Rebellion that the forces from Kent did not appear. England had only recently seen the end of the long 30 years ‘Wars of the Roses’ which had ended with the victory of Henry VII at Bosworth. Now Henry was turning his attention to suppressing the Scots and raising higher taxes to pay for it. The Cornish aggrieved by the taxes and the plight of their Tin Miners had marched to demand a fairer treatment. But Henry was not about to listen and turned his army that was preparing to subdue the Scots to first deal with their Celtic brothers. The rebels camped on the edge of the Blackheath, over looking London and the bridge at Deptford at the bottom of the hill. As it became obvious that the King would not conceed and the support of Kent would not appear many of An Gof’s supporters deserted the field. 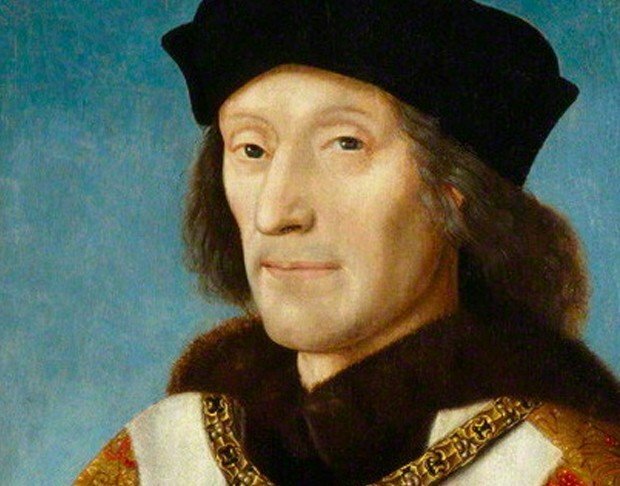 On the morning of 17th June 1497 Henry split his army numbering perhaps twenty five thousand into three. He sent two of the ‘battles’ around to the Lewisham side of the Heath to appear behind the rebels. The third group under Lord Daubeney waited until the other two were in position then attacked the detachment of Cornish holding the bridge. After fierce fighting Daubeney and his men overwhelmed the bridge and charged his men up the hill. The King’s troops soon overtook the mainly peasant rebel forces and were cut to pieces or put to flight. The three leaders were taken to the Tower and then executed, Audley being beheaded as a noble while An Gof and Flamank were hung drawn and quartered and all their heads displayed on pikes at London Bridge. 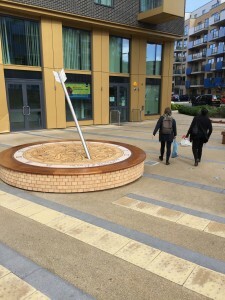 “I had been commissioned to create a public artwork for the new housing development at the bottom of Blackheath Hill and Lewisham Way by the housing association ‘Family Mosaic’, now part of the Peabody Trust. It was while I researched the local history that I discovered this dramatic historical event. My design to commemorate this battle was based on the concept of a Cornish shield with an arrow stuck into it. The memorial is a sundial and the arrow acts as the gnomon, casting it’s shadow to reveal the time on the shield. The shield design itself is a flight of fancy based on a Celtic broach I had seen in the British Museum. The whole mosaic sits on a raised brick platform with a wooden bench around the perimeter.